I had been debating the pros and cons of buying a good photographic printer for the last few years. From a cost perspective there is no question – it’s cheaper (when you factor in the capital cost of the printer) to get your prints produced in a laboratory. I’ve mainly used two UK labs – Photobox.co.uk and Loxley Colour – and both produce excellent results with Loxley marginally winning out in the quality stakes (I used them for my LRPS submission.) 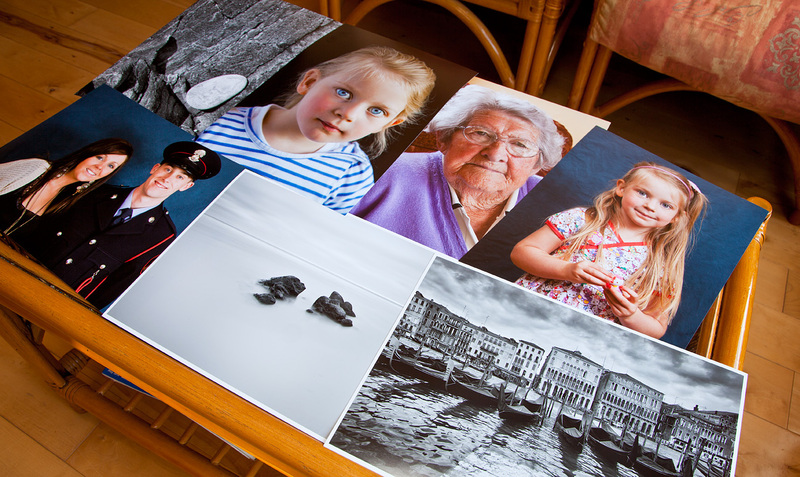 I’ve also used two Cork City labs – FD Photo Print in Ship Street and Right Brain in Wellington Road. The former’s prints are every bit as good as the UK labs while the latter’s is a very high quality service for those special prints deserving of fine-art paper such as Hannemuhle or Canson. On the other end of the scale I’ve also used Harvey Norman’s self service machines for 6×4 and 7×5 snapshots of birthday parties and the like. They’re perfectly acceptable when top quality isn’t a priority. The reason I’ve mainly used the UK labs is convenience – it is a simple process to upload the files from the comfort of home whereas going into town involves the hassle of parking to deliver them and calling back in a day or so to collect the prints. And so, as a belated birthday present to myself I decided to buy a printer. 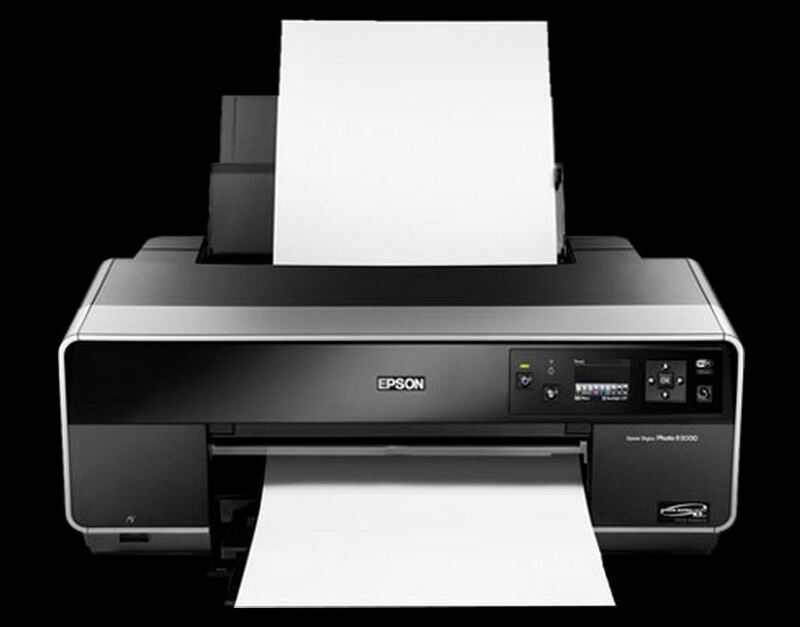 I had done my homework and I had no doubt which printer it was going to be – an Epson R3000, an A3+ printer that has garnered universal praise since its release. It ain’t cheap. I could have imported it from the UK for about €720 or so but I got in Barker Photographic in Frankfield, Cork for €749. Well worth the extra few quid in case anything should go wrong with the machine. Besides, Barkers are such nice and helpful people to deal with. Setting up the machine was very straightforward and it was ready to print after about 30 minutes or so. I chose a photo of my granddaughter Caoimhe for the first print (on Permajet Oyster A4 paper). I tweaked the print settings (paper size and type, colour, borderless) and pressed print. I fully expected the finished product to be disappointing and assumed there would be a sharp learning curve before I’d be able to produce a good result. I presumed the print would be either too dark or too light. To my surprise the print was just right and looked great. I was delighted. I take care to calibrate my monitor on a regular basis using the Spyder3 Express device and I have no doubt that has helped in producing prints that are as near as possible to what they look like on screen. So, so far so very satisfactory. I am delighted with the Epson. It’s a great printer and very simple to use. I’ve used Permajet Qyster paper to date but I’m going to experiment with fine-art papers such as Canson and Hahnemühle this year. Having a home printer means producing more prints – the convenience of just pressing a button to see what a photograph will look like in print will guarantee that. Previously, I chose with care the photos I wanted to print and thus only picked my best work. Now I can print anything I want whenever I want. Sure it will cost me money in paper and ink but so what? I met a photographer with very expensive gear on the Great Saltee last year. He had a Canon 1D Mark IV, Canon 300mm f/2.8 and Canon 500mm f/4 lenses, and a Gitzo tripod with a Wimberley head. Not much change (if any) out of €20,000 for that kit. Was he a professional? “Nope”, he said, “this is my golf”. Exactly. If you love doing something – be it golf, photography or whatever – and you can afford it, spend money enjoying it. Don’t scrimp. You can’t take it with you. Is it important to produce a steady stream of prints so as to avoid the printer’s ink-jets clogging up? Not in my experience. Weeks have elapsed without my printing anything and the printer happily worked away when I switched it back on. I can’t vouch for more irregular use but if you don’t plan to use one very often you are probably better off not getting one. What to do with all those prints? I belong to a camera club –the Cork Camera Group – and so prints are required on an ongoing basis for monthly competitions and the like. No more worrying if prints will arrive back from the lab in time for the closing date. Apart from that, there is great satisfaction in producing high quality family photos that will last a lifetime or more. Put them in an album for visitors to browse; frame photos; hang them on the walls of your house and change them around every six months or so; give some to friends as gifts. Leave a legacy of print that your children’s children’s children will look at some day. Photographs look so much better when they are printed. And they will endure. All the images you may have on hard-drives and/or web pages will disappear with advances in technology and the march of time. It probably won’t matter much for most of your work but for family photos in particular it is important that they be printed. I have been trying my hand at photographing the night sky recently. Not in any elaborate way by using a telescope with a camera adapter or anything like that – no, I’m very much a non-astronomer and my efforts fall far short of being worthy of the name “astrophotography”. This post is very much a record of my first tentative steps into the whole area and is most certainly not an authoritative guide. It may be useful however to others thinking of experimenting. 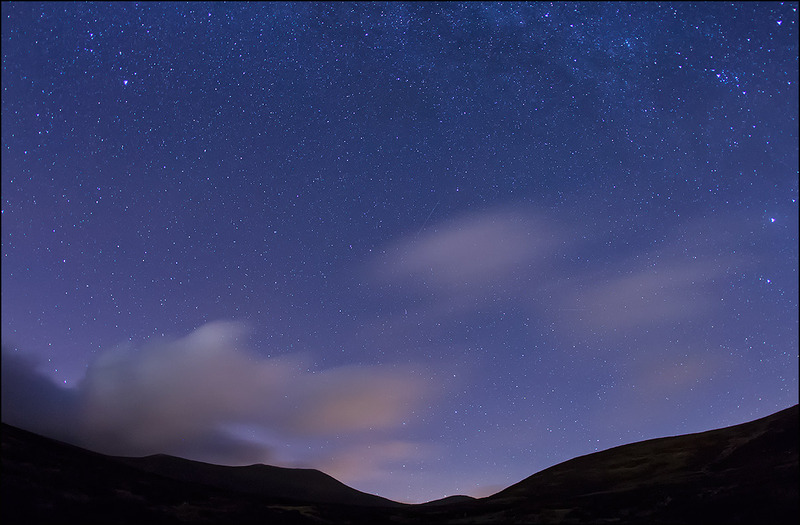 The biggest problem in photographing the night sky in Ireland is the weather. We don’t often get clear skies on a moonless night. (A moonless night – or a new or crescent moon – is necessary as a full, quarter or gibbous moon would make the sky too bright.) Then there is the problem of finding somewhere with minimal noise pollution from towns, cities, factories and the like. It is almost impossible to find a location with none. Not that all such light is unwelcome – on the contrary, I have seen some excellent astrophotography shots that creatively used earthly light sources. Also, some photographers have used torches to illuminate old buildings, dolmens and so forth in the foreground and this can be very effective. I use the Sundroid app on my Android phone to keep track of the phases of the moon and when it rises and sets. There are several such available – The Photographer’s Ephemeris is another very good one. Equipment-wise, I use a Canon 5D Mark 11 and the widest angle lens I have which is the Canon 15mm f/2.8. Unless you want to capture star-trails the maximum shutter speed to use is 30 seconds – longer than that and the stars will start to trail i.e. they will appear as streaks instead of points of light. Use the widest aperture of your wide-angle lens – in my case f/2.8 – and set the ISO. Experiment with the ISO to see which gives the best results but it will invariably be in the 1600 to 6400 range. 3200 works best for me. I find it extraordinary that modern DSLRs produce so little noise at such high ISOs. Back in the day, we were pushing the envelope when using 400 ISO! Naturally, a tripod and remote trigger is required. Don’t be tempted to manually press the shutter button. And ideally employ mirror lock-up as well to further minimise camera shake. Focusing can be a problem – especially with the 5D Mark 11 which is not renowned for auto-focusing in low light. If you can’t get a fix on a bright planet, manually focus at infinity and check the results as the infinity mark on lenses isn’t always accurate. Another essential piece of kit is a torch – preferably a head-torch (I use a Petzl Tikka plus 2) so that you can keep your hands free to operate the camera. Not merely will it allow you to see what you’re doing with the camera and lens it will help you find your way back to your car when you are finished. And don’t do as I do and go wandering off into the mountains on your own at night as it could be dangerous. At least make sure you tell someone where you’re going. And shoot in RAW, of course. This will allow you to set the colour balance in Photoshop and I find I get the most pleasing results when I use the tungsten light setting. As I say, I am only finding my feet in this whole area and any tips that people may have will be greatly appreciated. 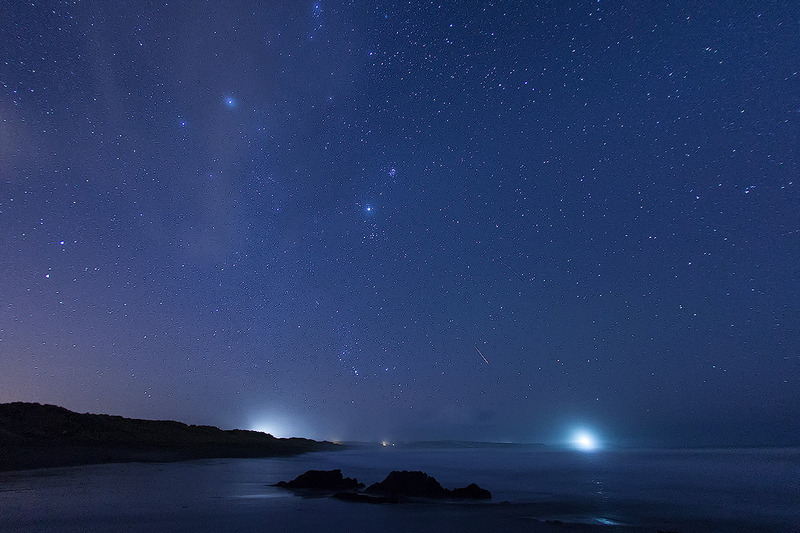 Galley Head Lighthouse (West Cork) is on the right, the light on the left is from some private houses. A couple of light streaks from jets passing over head are also visible. 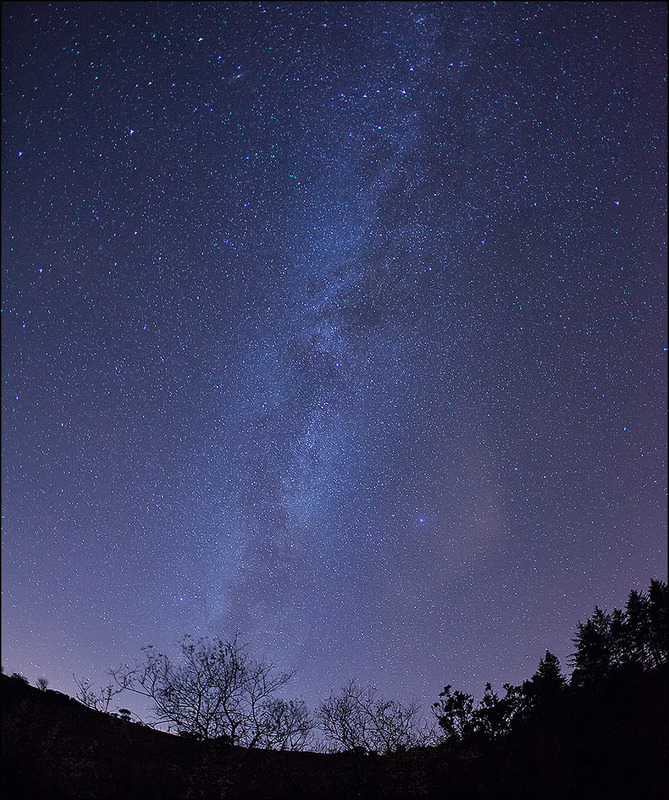 Apart from the photography, heading out into the countryside and staring up at the majesty of the night sky is an awesome experience. It is worth it for that alone. If you come back with some usable images so much the better.